Do you find your hair to be a bit unruly or rebellious from time to time? Maybe it’s just too dry and frizzy to style? Or too many split ends and breakage caused by over processing? Sometimes color fades too fast and never looks as brilliant and shiny as you’d like. Never fear, here at Citrine Salon we offer a wide variety of incredible masks to treat your every hair need, plus tips on how to get the most out of every product. Keep reading to find which mask is the best for you! Goldwell Kerasilk Control Mask- Beat frizz with this intensive smoothing mask. Infused with keratin as liquid silk, this product is perfect for unmanageable frizzy hair. Use this mask on wet or damp hair, leave in for 5-10 minutes, and then rinse for stunning, shiny, frizz-free hair . This mask is also the perfect complement to a recent Kerasilk service as it prolongs the life of the treatment. Oribe Masque for Beautiful Color- This unique masque offers three major benefits when it comes to color treated hair to make sure each strand remains in tip top condition throughout the coloring process. First, the masque repairs existing damage to the hair while cuticle conditioning ingredients keep hair looking smooth and healthy. Second, UV-protecting ingredients that utilize innovative bio-polymers work to keep fading at bay and your color fresh in between appointments. Last but not least, this masque also offers beautiful glossing properties which increase shine and enhance all hair colors for a rich look that never disappoints! If you have any type of color treated hair, this masque is a must! BB Hairdresser’s Invisible Oil Pre Shampoo Masque- Perfect for wavy or curly textures, this unique balm liquefies in your hands, making it a breeze to apply. This oil infused formula helps de-frizz, detangle, and keep your curls soft and shiny. Just take a small amount and run through you hair. Leave in for 20 minutes and then follow through with your favorite shampoo and conditioner. 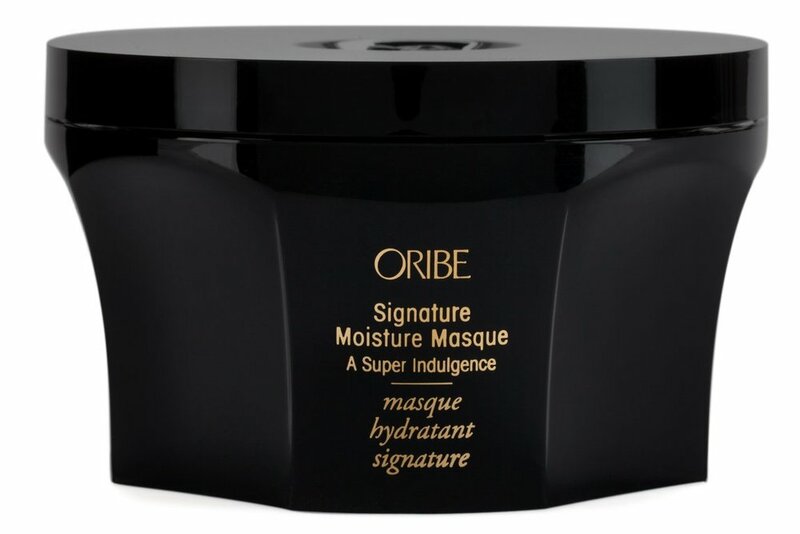 Oribe Signature Moisture Masque- This mask is the perfect fit for any hair type that has become dry and damaged and needs a little extra moisture to bring it back to life. Weightless in density yet deeply hydrating, this masque utilizes a unique blend of plant and keratin extracts to strengthen weakened hair and keep it supple, soft and manageable for future styling. Color safe and UV-protecting, this masque in particular also includes sunflower seed extract, macadamia nut seed oil and wild mango butter for maximum shine and increased smoothness. After all, everyone could use a little everyday indulgence! Wet Brush Towel Set- One of our favorite tricks to help masks penetrate the hair to their full potential is to wrap hair in a hot towel after the mask has been applied. Similar to the effect of sitting under a dryer in salon, the heat expands the hair shaft and allows the mask to penetrate further so you get the maximum benefit possible! To get the same effect at home, put a towel in the dryer for a few minutes and immediately wrap your hair to get the most benefit! BB While you sleep damage repair masque- Repair dry, damaged, or over-processed, hair overnight with this lightweight sleeping masque. Not only is this masque very hydrating, it also contains Evening Primrose to repair dry strands and protect from future damage. Just apply to dry hair once or twice a week, leave it in for as long as you’d like or keep it in overnight for intense hydration. Oribe Gold Lust Transformative Masque: For the truly damaged and broken hair, be sure to check out Oribe’s heavy duty Transformative Masque which utilizes white tea, baobob and jasmine extracts to penetrate the hair shaft to undo the negative effects of over processing and to restore health and elasticity. Use sparingly as this masque is very concentrated and will heal hair in no time!